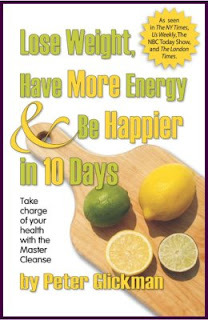 Today is day 10, my last day, of the Master Cleanse. I'm so excited to be done but also excited about all the benefits. 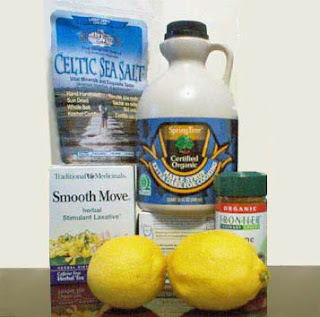 The Master Cleanse is a dieting program created by Stanley Burroughs in 1941 and made popular by Peter Glickman who promotes Burroughs' regimen to a modern audience. Burroughs states that it is a detoxification program that aids in the removal of harmful toxins from within the body, as well as a reducing diet for loss of weight, and a cure for ulcers and "every kind of disease," resulting in "the correction of all disorders." The cleanse involves drinking only a concoction made from fresh lemons, grade B maple syrup and cayenne pepper. No food is eaten for the entire cleanse. The basic cleanse is 10 days although you can go longer. Each morning you drink 1 quart of salt water and every evening one cup of Smooth Move tea. Though its tough and takes a ton of self control to go 10+ days without food I think it is well worth it! During the cleanse I've felt a lot better, have more energy, and have dropped a few pounds.